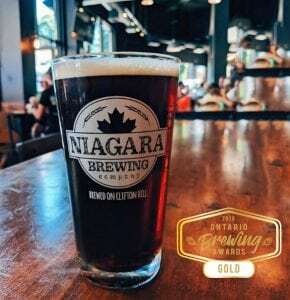 Niagara Brewing Company’s award-winning Irish Ale. On September 13th, brewers from across Ontario came together at The Berkeley Church in Toronto for the 2018 Ontario Brewing Awards. We’re very happy to announce that Niagara Brewing Company took home gold in the Irish Ale category – one of 40 categories recognized at the ceremony. Our Irish Red Ale is currently available on the rotating taps and is a classic Irish style brew that features a prominent malt flavour with hints of caramel, biscuit, and toffee. The ale’s herbal hop notes provide a classic British hop aroma and make for a refreshing beer that starts off slightly sweet and finishes dry. The Irish Red Ale is an essential part of many brewery lineups in Ireland and we’re excited to be offering our very own award-winning version in Niagara Falls! Stop by the brewery today to try it and experience Niagara craft beer just steps away from the Falls.